Looking for a cheap ticket to Jakarta? Here you can search all major low-cost airlines for cheap flights to Soekarno–Hatta International Airport (CGK). The Soekarno–Hatta International Airport is located 20km from the Jakarta city center. A taxi from Soekarno–Hatta International Airport to Jakarta center would cost IDR 150.000. Before you book a flight you can use Utiket to find the cheapest flights to Jakarta for Garuda Indonesia (GA), Lion Air (JT), Batik Air (ID), Citilink (QG), Thai Lion Air (SL), Sriwijaya Air (SJ). All flight data are real-time and accurate. Follow the links to search and book your cheap ticket to Jakarta directly with the airline or one of our partnering travel agents. The Soekarno-Hatta International Airport of Jakarta is a huge airport, currently the tenth busiest in the world and one of the fastest growing airports in the world. The Jakarta airport is the main hub for every airline for flights throughout Indonesia. 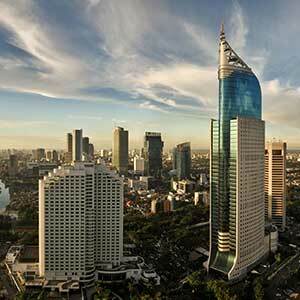 Often direct flights between cities are not available or expensive and the best option is often with a transfer in Jakarta. From Jakarta you can reach every corner of Indonesia as well as numerous international destinations. Read more about Soekarno–Hatta International Airport.